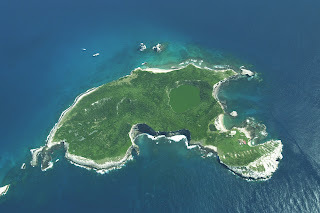 This is Isla Isabel, a Sanctuary in Riviera Nayarit devoted to environment preservation. It is located 28 kilometers away from San Blas shore, and 61.5 kilometers from Islas Marias. In 1980 was declared Natural Park, and in 2000 was protected an environmet reserve. It's home to several birds, coral reef and in the sourroundings you can find humpback whales, whale sharks and turtles. First register for a person steping into the Island is dated 1836, on the name of captain Abel Aubert Dupetit Thouars (3 August 1793 – 16 March 1864), who was a French naval officer important in France's anexation of French Polynesia. His visit to Isla Isabel is related on his book of memories Circumnavigation around the World on La Venus. Nowadays can be visited under special permission, often requested and granted to birdwatching expeditions.